Five GREEN ways to celebrate the Holidays | Bringing together stories, rooms, life. Christmas is definitely a joyous time to celebrate with family and friends. Traditions are honored and memories are made. But as soon as the holidays are over, the amount of trash going out the door is a horrible waste. Between Thanksgiving and New Year’s Day, Americans throw away a million extra tons of garbage a week (source: Robert Lilienfeld, co-author of the book “Use Less Stuff”). Here are a few simple things we all can do this year to have a greener Christmas for years to come. 1. Refrain from buying a commercially grown Christmas tree which takes an average of 10 years to grow while lasting only a month in your living room. Every year, 50 million Christmas trees are sold of which 30 million end up in our over-stuffed landfills (source: recycleworks.org). Instead, choose a live potted tree that can be replanted or moved outdoors after the season. 2. 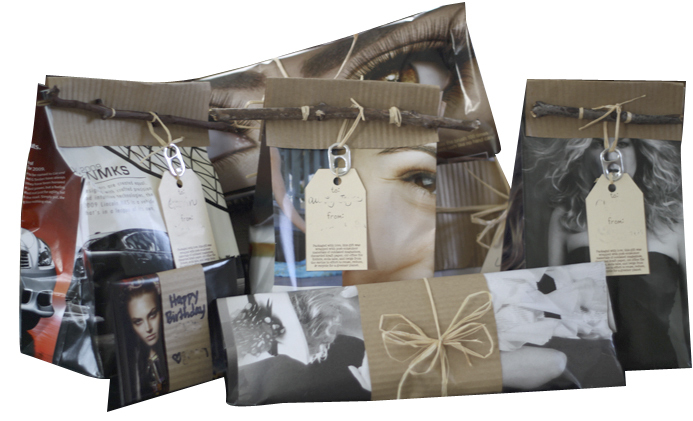 Wrap gifts with reused materials such as magazines or newspaper. Traditional gift wrap cannot be recycled because it is often dyed & laminated and contains non-paper additives. If every American family wrapped just 3 gifts with reused material, it would save enough paper to cover 45,000 football fields (source: earth911.com). 3. Keep holiday cards you receive this year to create next year’s gift tags or paper ornaments. 2.65 billion Christmas cards are sold each year. (source: recycleworks.org) This year, consider sending e-cards. 4. Save your holiday ribbon and gift wrap you receive to reuse for next year. Fabric ribbon can be ironed and gift wrapping can be folded nicely and stored. If every family reused just 2 feet of ribbon, we would save 38,000 miles of ribbon (source: recycleworks.org). Donate the money you save to an environmental organization. 5. For your holiday dinner, consider buying locally grown foods, which hasn’t traveled 3,000 miles to get to Hawaii using petroleum for transport and refrigeration. Support Hawaii’s local farmers by buying directly from your neighborhood open market. By making smarter choices we can start new and greener traditions to ensure joyous celebrations for generations to come. Reblogged this on HomeWorld Furniture. This entry was posted on December 19, 2011 by C. S. Wo & Sons, Ltd. in Uncategorized and tagged gift wrap, green, magazine gift wrap, recyle, recyling, reuse.